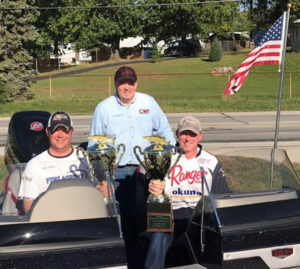 The Professional Musky Tournament Trails season came to a very exciting, fish-filled conclusion on October 20-21 in the Ranger Boats World Championship on the northern Indiana chain of lakes Webster, Barbee and Tippecanoe. PMTT Champs Mathew Quintano and Spencer Berman sit in their new Ranger boat with PMTT Director Tim Widlacki (center). Cooler-than-normal temperatures and post-turnover conditions produced a fall feeding frenzy as PMTT teams registered 68 muskies. On Saturday, 40 mph wind gusts, freezing rain and whatever else Mother Nature could throw at the anglers arrived, while Sunday produced 30-degree air temperatures and a brisk damp breeze. 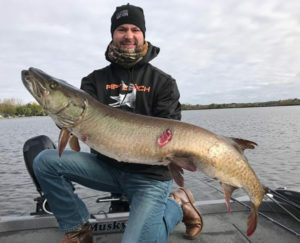 The team of Spencer Berman and Mathew Quintano of Harrison Township, Michigan, produced a record 10 muskies measuring to 41 inches in length. The two anglers cast to a wind-blown, baitfish-covered breakline point on Lake Webster with Magnum and Pounder Bull Dawg lures in gold/black color pattern. The champs said the cadence of retrieve was crucial for their success, with very slow pulls and a slow retrieve between pulls being the ticket. Berman and Quintano won two straight PMTT events to prove that they are truly the PMTT World Champions for 2018. 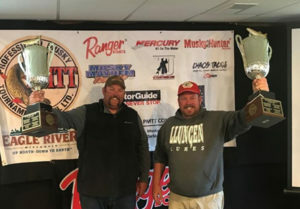 Their success earned them a brand new 2019 Ranger 619FS boat, RangerTrail Trailer powered by a Mercury Outboard, and valued at over $50,000 with two championship trophies. In second place was the team of Joe Restivo of Fremont, Indiana, and Bob Vandermeer of Walbridge, Ohio, who also caught an impressive 10 muskies up to 38 1/2 inches. Restivo and Vandermeer used small glide baits in three feet of water in a widening of the river channel that feeds Lake Webster and caught all their muskies in the area that was about a hundred yards square. In third place with seven muskies up to 33 inches was Billy Brummett of Fort Wayne, Indiana, and Michael Handlogen of Grand Rapids, Michigan, who used shad- and walleye-colored glide baits on Lake Webster to entice their fish. Sam Ubl with the big musky of the championship, a 49 1/4-incher. In fourth place were Bryan Schaeffer of Tomahawk, Wisconsin, and Sam Ubl of Mukwonago, Wisconsin, who used Lake X Rubber baits to catch the big fish of the tournament at 49 1/4 inches to go with their 39 1/4-inch musky caught on the Barbee Chain. Schaeffer an Ubl were fishing 20 feet of water where they saw baitfish moving up in the water column and retrieved their baits with a slow pump-and-pause motion. Rounding out the top five were Mike Olson and Nate Ruszkiewicz of Milwaukee who caught three muskies up 43 1/4 inches on the Barbee Chain using small, white twitchbaits in three feet of water in junk weeds. The prestigious Top Gun-Team of the Year award was also awarded at the championship. The award goes to the team that is the most consistent, placing and gaining points throughout the year. For the second year in a row, the Top Gun award goes to Chris Riebe of South Elgin, Illinois, and Matt Snyder of Tower, Minnesota. The two anglers said part of their success comes from not pre-fishing a lot, just driving around the lake previous to the tournament looking for areas with baitfish and weedlines while marking the areas on maps. Riebe and Snyder have caught muskies in a record 13 PMTT events in a row. Matt Snyder and Chris Riebe repeated as winners of the Top Gun/Team of the Year. Second place in the Top Gun goes to Tony Grant of Frenchburg, Kentucky, and Gregg Thomas of Morehead, Kentucky. Third place in Top Gun goes to Bryan Schaeffer and Sam Ubl. The PMTT will kick off its 2019 season at Cave Run Lake near Morehead, Kentucky, in April and Eagle River, Wisconsin, in June. For more information, visit promusky.com or call the PMTT office at (815) 478-4092.